You know I don’t play favorites with my cookbooks. But still. Even though I love them all equally, there are some that are a little bit special. Flour by Joanne Chang is one of those. So, needless to say, I was excited about her new book, Flour, Too , which was just released and of which I received a review copy. While the first book included all the baking recipes from her Flour bakeries and cafes in Boston, the new one shares the savory side of the menus with a few more sweets as well. As I read through the Soups section of the Lunch chapter, it occurred to me that I didn’t realize I like soup so much. Based on Chang’s descriptions, I wanted to try all of these soups. There’s a pureed Eggplant Parmesan soup made with tomatoes and fresh basil that made me want to run to the farmers' market for the ingredients. And, I already tried the Chilled Spanish White Gazpacho with green grapes, blanched almonds, and cucumbers. 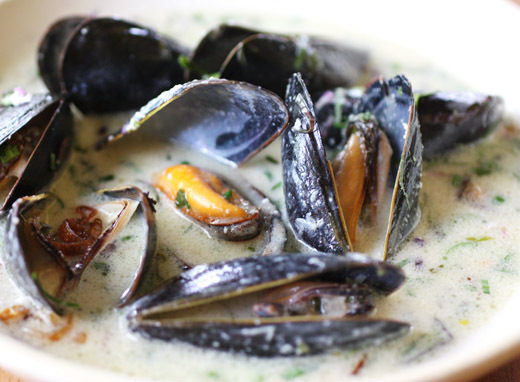 It’s a lovely chilled soup for summer with a drizzle of olive oil and maybe a few drops of aged Sherry vinegar on top. Next, both breakfast and lunch sandwiches made me hungry with options like Flour’s Famous Egg Sandwich on homemade focaccia rolls; Lemony Hummus with Cucumber, Radish Sprouts, and Red Onion; and Grilled Tofu with Olive Tapenade and Roasted Vegetables. There are also salads, mains, snacks, drinks, desserts, and breakfast sweets. Chang’s attention to detail is just as evident here as it was in the first book as the story of each dish is revealed. Everything on the menu was tested, tweaked, and perfected for serving with the best ingredients for each season. Apparently, when the first book came out, regular Flour customers were disappointed that it didn’t include the recipe for Cinnamon-Cream Brioche. At the bakery, the small quantity made each day sells out quickly, and everyone wanted to try making them at home. So, the recipe was included in Flour, Too. A rich brioche dough was made, and you can either make half the recipe provided or just make the whole amount as I did and bake one loaf of brioche with the extra dough. The other half of that dough was divided into eight portions which were stretched into little round pizza shapes with a thicker edge and thinner middle. Pastry cream, which can be made in advance and kept chilled, was spooned into the center of each dough round. The pastry cream was topped by creme fraiche. The pastries were then sprinkled with cinnamon sugar before going into the oven for about 30 minutes. The pastry cream and creme fraiche did spread and run over the brioche edges, but it’s no cause for concern. There was still plenty of delicious cinnamon-sugared cream in each pastry. They’re delightful all by themselves, but since we had fresh, local berries on hand, I used them for garnish. Kurt would love it if my next stop in the book is the Boston Cream Pie with its four layers of sponge cake brushed with coffee syrup and stacked with thick layers of diplomat cream. I’d like to try the Cantaloupe-Mint Seltzer, Scallion Pancakes, and Summer Three-Bean and Potato Salad with Fresh Herbs. I’ll eventually get to all of that and more. Just don’t tell my other cookbooks about that “special” category I mentioned. Recipes reprinted with publisher’s permission from Flour, Too . We only make a few of these each morning, and as soon as they come out of the oven, they are snatched up by waiting customers. When the first Flour book came out, there was an outcry from these loyal cinnamon-cream devotees because the recipe was not included. It wasn’t an intentional omission; in my mind, this pastry was something we kind of threw together each morning and thus it didn’t really need a recipe. Clearly I was wrong. We were inspired by a recipe for a similar pastry in Nancy Silverton’s book, Pastries from the La Brea Bakery, called Viennese Cream Brioche, which she describes as being so sublime that it made Julia Child cry. With that description, how could we resist trying our hand at making them? The recipe uses ingredients that we always have in our fridge—brioche dough, pastry cream, crème fraîche—and puts them together in a way that makes quite an addictive treat. Be generous with the cinnamon-sugar that is showered on top; it’s what makes these so crunchy and irresistible. 1. Preheat the oven to 350°F/180°C, and place one rack in the center and one rack in the top third of the oven. Line the baking sheets with parchment paper. 2. Shape the brioche dough into a rectangle about 8 in/20 cm long, 4 in/10 cm wide, and 1 in/2.5 cm thick. Using a ruler and a knife, cut the rectangle into eight 2-in/5-cm squares by first dividing it in half horizontally and then dividing it vertically into strips 2 in/5 cm wide. Each square of dough should weigh about 3 1⁄2 oz/100 g.
3. Stretch each dough square into a circle about 5 in/12 cm in diameter as if you are making a small pizza. Stretch the inner part of the circle so that it is quite thin and shape the edge of the circle to create a rim. The center should be almost paper-thin and the finished circle should look like you are making the crust for a mini deep-dish pizza. Place the brioche circle on one of the prepared baking sheets and repeat with the remaining dough squares, spacing them 2 to 3 in/5 to 7.5 cm apart and using both baking sheets. 4. 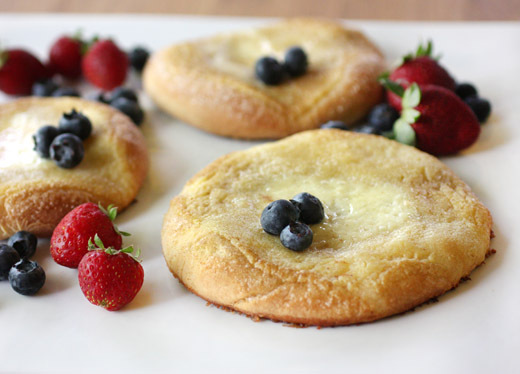 Using the back of a spoon, spread 2 tbsp of the pastry cream over the base of each brioche circle, spreading it evenly and leaving the rim bare. 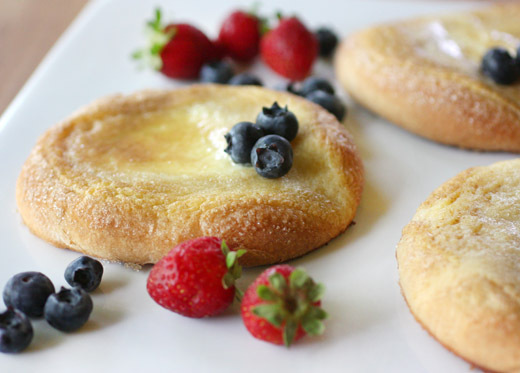 Place about 3 tbsp of the creme fraiche in the center of each brioche circle and gently spread it, again covering the base of the circle and leaving the rim untouched. In a small bowl, mix together the sugar and cinnamon, then sprinkle the mixture evenly over both the creme fraiche center and the rim of each circle. 5. Bake the pastries, switching the baking sheets between the racks and rotating them back to front about halfway during baking, for 25 to 30 minutes, or until they are medium golden brown along the edge. (Sometimes the creme fraiche spills out over the edge of the circle. Don’t fret; when the pastries come out of the oven and cool a bit, you can scoop spillover back into the center.) Let the creme fraiche set and the brioche cool on the baking sheets for 10 to 15 minutes before serving. Cinnamon-creams should be served the day they are made; they don’t hold very well overnight because of their creamy centers. 1. Using the stand mixer, combine the all-purpose flour, bread flour, yeast, sugar, salt, 5 eggs, and 1⁄2 cup/120 ml water and beat on low speed for 3 to 4 minutes, or until all of the ingredients have come together. Stop the mixer as needed to scrape the sides and bottom of the bowl to make sure all of the flour has been incorporated into the wet ingredients. Once the dough has come together, beat on low speed for 3 to 4 minutes longer. The dough will be stiff and seem quite dry. 2. Still on low speed, add the butter, one piece at a time, mixing after each addition until it disappears into the dough. After all of the butter has been added, continue mixing on low speed, stopping the mixer occasionally to scrape the sides and bottom of the bowl, for about 10 minutes. It is important to mix all of the butter thoroughly into the dough. If necessary, break up the dough with your hands to help incorporate the butter. 3. Once the butter has been completely incorporated, increase the mixer speed to medium and beat for another 15 minutes, or until the dough becomes sticky, soft, and somewhat shiny. It will take some time for it to come together; it will look very shaggy and questionable at the start but in time will turn smooth and silky. When that happens, increase the speed to mediumhigh and beat for about 1 minute. You should hear the dough make a slap-slap-slap sound as it hits the sides of the bowl. Test the dough by pulling at it; it should stretch a bit and have a little give. (If it seems wet and loose and more like a batter than a dough, add 2 to 3 tbsp flour and mix until it comes together.) If it breaks off into pieces when you pull at it, continue to mix on medium speed for another 2 to 3 minutes, or until it develops more strength and stretches when you grab it. It is ready when you can gather it all together and pick it up in one piece. 4. Transfer the dough to a large bowl or plastic container and cover it with plastic wrap, pressing the wrap directly onto the surface of the dough. Let the dough proof (that is, expand and develop flavor) in the refrigerator for at least 6 hours or up to overnight. (At this point the dough may be frozen in an airtight container for up to 1 week. Thaw overnight in the refrigerator before using.) If you are making a brioche treat, proceed as directed in the individual recipe. 5. Line the bottom and sides of the loaf pans with parchment paper, or butter the pans liberally. 6. Divide the dough in half, and press each half into about a 9-in/23-cm square. (The dough will feel like cold, clammy Play-Doh.) Facing the square, fold down the top one-third toward you, and then fold up the bottom one-third, as if folding a business letter. Press to join the three layers. Turn the folded dough over and place it, seam-side down, into one of the prepared pans. Repeat with the second piece of dough, placing it in the second prepared pan. 7. Cover the loaves lightly with plastic wrap and place in a warm (78° to 82°F/25° to 27°C) area to proof for 4 to 5 hours, or until the loaves have nearly doubled in size. They should have risen to the rim of the pan and have a rounded top. When you poke at the dough, it should feel soft, pillowy, and light, as if it were filled with air—because it is! The loaves have finished proofing and are filled with yeast air pockets. At this point, the texture of the loaves always reminds me a bit of how it feels to touch a water balloon. 8. Preheat the oven to 350°F/180°C, and place a rack in the center of the oven. 9. In a small bowl, whisk the remaining egg until blended. Gently brush the tops of the loaves with the beaten egg. Bake for 35 to 45 minutes, or until the tops and sides of the loaves are completely golden brown. Let cool in the pans on wire racks for 30 minutes, then turn the loaves out of the pans and serve warm or continue to cool on the racks. The bread can be stored tightly wrapped in plastic wrap at room temperature for up to 3 days (if it is older than 3 days, try toasting it) or in the freezer for up to 1 month. 1. In a medium saucepan, heat the milk over medium-high heat until scalded; that is, until small bubbles form along the sides of the pan. While the milk is heating, in a small bowl, stir together the sugar, flour, and salt. 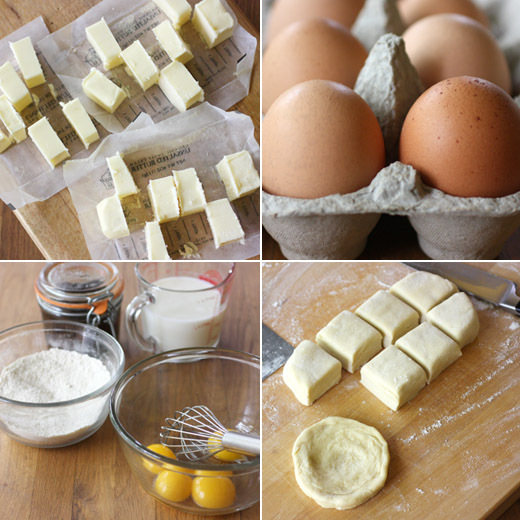 (Mixing the flour with the sugar will prevent the flour from clumping when you add it to the egg yolks.) In a medium bowl, whisk the egg yolks until blended, then slowly whisk in the flour mixture. The mixture will be thick and pasty. 2. Remove the milk from the heat and slowly add it to the egg-flour mixture, a little at a time, while whisking constantly. When all of the milk has been incorporated, return the contents of the bowl to the saucepan and heat over medium heat, whisk continuously and vigorously, for about 3 minutes, or until the mixture thickens and comes to a boil. At first, the mixture will be very frothy and liquid; as it cooks longer, it will slowly start to thicken until the frothy bubbles disappear and it becomes more viscous. Once it thickens, stop whisking every few seconds to see if the mixture has come to a boil. If it has not, keep whisking vigorously. As soon as you see it bubbling, immediately go back to whisking for just 10 seconds, and then remove the pan from the heat. Boiling the mixture will thicken it and cook out the flour taste, but if you let it boil for longer than 10 seconds, the mixture can become grainy. 3. Pour, push, and scrape the mixture through the sieve into a small, heatproof bowl. Stir in the vanilla and then cover with plastic wrap, placing it directly on the surface of the cream to prevent a skin from forming. Refrigerate for at least 4 hours, or until cold, before using. The cream can be stored for up to 3 days in an airtight container in the refrigerator. As I read the May issue of Bon Appetit, I noticed one mention after the next of little, old Austin. I thought: what are we, Portland? Clarks Oyster Bar was noted in Dish of the Moment regarding shrimp toast; in a list of uses for hot sauce, the Michelada was inspired by one from a dive bar in Austin; and in the Good Health section, there was a story about our Lake Austin Spa Resort. We are pretty proud of our food scene here in Austin, so it’s nice to see our city being referenced more often in magazines lately. 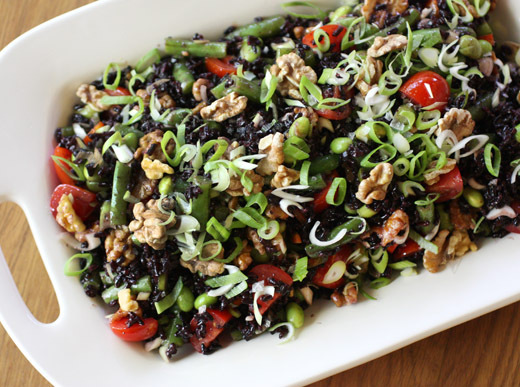 It was in that story about Lake Austin Spa where I found this Black Rice Salad, and the recipe is available online. 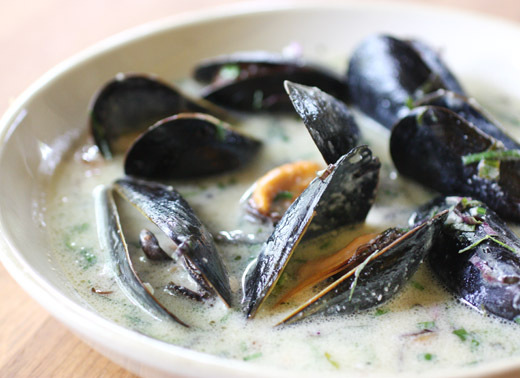 This is an ideal dish to have on hand as our hot, summer weather settles in. Having a big bowl of this in the refrigerator makes grabbing a healthy lunch easier than ever. I collected some local green beans and tomatoes at the farmers’ market and mixed them with thawed edamame and sliced green onions. 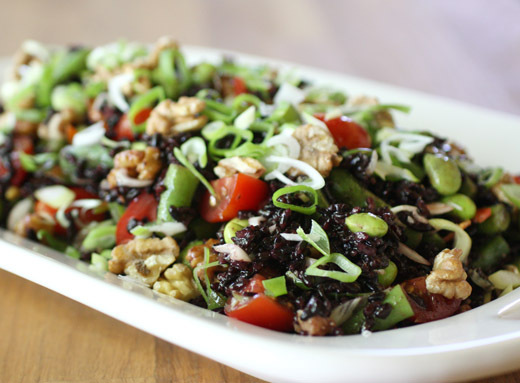 The bright red of the tomatoes and greens of the other vegetables look great with the dark, glossy black rice. Toasted walnuts add some protein and crunch. 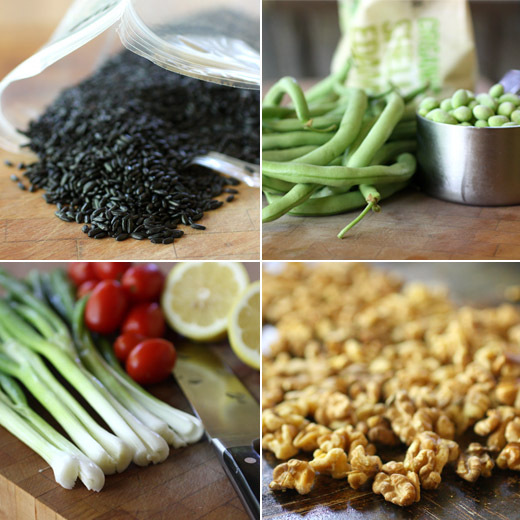 Black rice requires about 35 to 40 minutes of cooking, so start that first. Once the rice is tender, you need spread the rice on a baking sheet to let it cool. While the rice cooks, toast the walnuts in the oven, and whisk together the vinaigrette. Lemon juice, white wine vinegar, and honey were whisked together, and olive oil was drizzled in while whisking to complete the vinaigrette. Season with salt and pepper to taste. I like a lot of pepper with lemon. The original recipe doesn’t include cooking the green beans, but I don’t really like raw green beans so I blanched them after cutting them into small pieces. The edamame was thawed, the green onions were thinly sliced, and the grape tomatoes were halved or quartered. Everything was tossed in a large bowl, and the salad was ready for serving. You could add a little decadence to this otherwise very healthy dish by topping it with crumbled goat cheese or feta, but it really doesn’t need it. My favorite accompaniment to it was extra tomatoes since they’re so good right now. This dish is just one more thing to love about Austin. If I plan to serve dip at a party, it’s always homemade. And, when I start thinking about what kind of dip to make, my next thought is that I really should make the crackers too. I have a recipe or two here and there for flatbreads that work with dips, but I didn’t have a good reference for a variety of crackers until now. Crackers and Dips by Ivy Manning, of which I received a review copy, will solve all my future party snack dilemmas. With each cracker recipe, there’s a suggested dip or two to go with it. Corn Bread Crisps with Tangy Roasted Tomatillo and Avocado Dip sounds like a great match, and so does Black Pepper Taralli and Trieste-Style Crab Gratin. There are crackers with simpler flavors like Soda Water Crackers that work well as shy vehicles for toppings and some like Brown Butter-Hazelnut Crackers that draw more attention to themselves. There are even dessert crackers like Rosemary Graham Crackers and Animal Crackers with Zesty Lemon Frosting, and I ordered some little animal-shaped cutters just so I could try these. The first recipe I wanted to taste from the book was Caesar’s Sables which capture all the big flavors of a Caesar salad in a neat, little cracker. Serving suggestions for them included using them as croutons on a Caesar salad or as an accompaniment to Warm Olive Tapenade with Preserved Lemon. They were great both ways. The dough for the crackers is just like that for refrigerator cookies. In fact, you can keep the dough wrapped and refrigerated and just slice and bake some crackers as you need them rather than making them all at once. 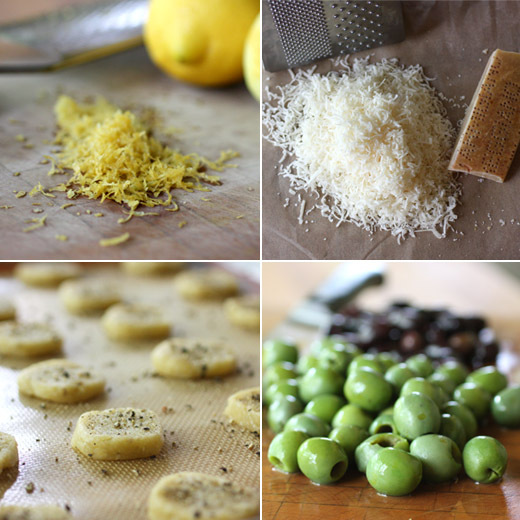 Flour, grated parmesan cheese, olive oil, lemon zest, finely chopped garlic, and salt were pulsed in a food processor. 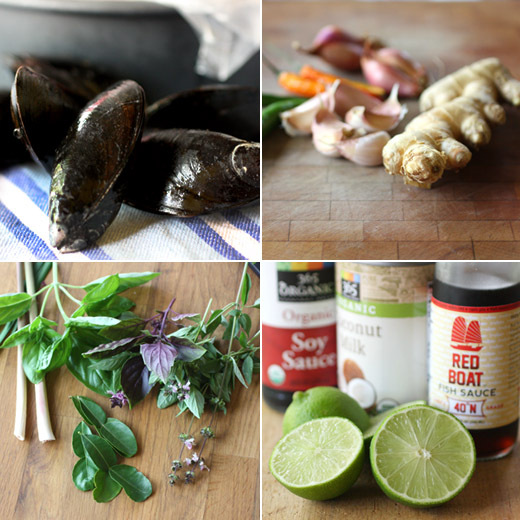 Anchovy paste is an optional ingredient, and I added it because I love the extra hit of umami from anchovies. So, the anchovy paste was added with some water, and the mixture was pulsed until the dough came together. The dough was divided in half, and each was kneaded and rolled into a long cylinder. The dough cylinders were wrapped in plastic and chilled for a couple of hours. Meanwhile, I made the tapenade which was started by sauteing finely chopped shallot and garlic, and fresh thyme. Then, chopped pitted Castelvetrano green olives, pitted Kalamata black olives, and finely chopped preserved lemon were added and warmed. The tapenade can be stored in the refrigerator and re-warmed before serving. The cracker dough cylinders were sliced into thin circles, the circles were topped with freshly ground black pepper, and then baked for about 15 minutes until browned and crunchy. 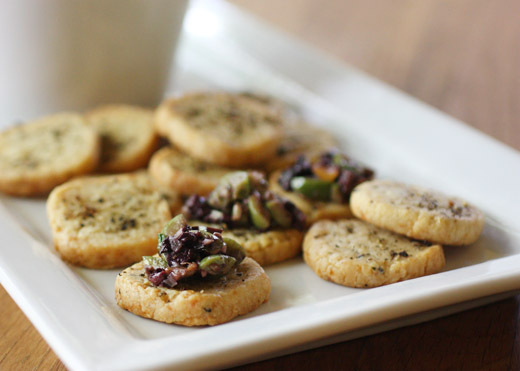 These peppery, parmesany, and slightly lemony crackers with the tapenade were great with drinks for a pre-dinner snack. And, I love that I don’t have to fret about what I could possibly make to go with dip ever again. I just have to decide which combo to try next. Recipes reprinted with publisher’s permission from Crackers and Dips . Everyone loves Caesar salad. So what if you could fit all the savory, salty flavor of that brilliant salad into a little crumbly cracker? Caesar lovers everywhere, rejoice: here is your cracker! These rich crackers are similar to the French pastry/cookies called sables [sah-BLAY], which means “sandy,” and as the name advertises, these crackers have a sandy, crumbly texture and they’re very rich, thanks to an ample dose of lemon olive oil. The dough can be made up to three days in advance, so they’re perfect for entertaining; just slice and bake when needed. Try them with a dab of Warm Olive Tapenade with Preserved Lemon, eat them by the handful, or use them as a garnish for Caesar salads as a sort of overgrown crouton. Whatever the application, they’re tres delicieux. In a food processor or large bowl, pulse or mix the flour, cheese, olive oil, lemon zest, garlic, and salt until well combined and crumbly. Add the anchovies (if using) and water. Pulse or stir until the mixture becomes crumbly and begins to stick together, 15 pulses (do not overmix), stopping once to scrape the sides of the bowl. Turn half of the dough out onto a 16-in-/40.5-cm-long piece of plastic wrap and squeeze and gently knead the dough to form it into an 8- to 9-in-/20- to 23-cm-long log that is about 1 1/4in/3.5 cm in diameter. Roll up the log in the plastic wrap and roll on the work surface under your palms to make a uniform cylinder. Repeat with the other half of the dough and another piece of plastic wrap. Chill the logs in the refrigerator until firm, at least 2 hours and up to 3 days. Preheat the oven to 350°F/180°C/gas 4. Line a baking sheet with a silicone baking mat or parchment paper. Unwrap the logs and use a sharp, thin-bladed knife to cut the logs crosswise into 1/8-in-/3-mmthick slices using a gentle sawing motion. If any crumbly bits break off while slicing, press them into the cracker and shape with your fingers into a round. Arrange the slices 1 in/2.5 cm apart on the baking sheets and sprinkle them with the pepper. If any of the crackers were sliced too thickly, use your fingers to press them out until they are of the same thickness as the others. Bake until the crackers are golden brown around the edges, 15 to 20 minutes. Rotate the pans once from top to bottom and from back to front while baking. Transfer the crackers to a cooling rack. Once cool, store the crackers in an airtight container at room temperature for up to 4 days. Cold olives leave me cold. You can marinate them, stuff them, or purée them into a tapenade, but if they’re cool, I’m bored to tears. Warm olives are another matter. Applying just a little heat to olives transforms them into a fruity, sensuous pleasure. 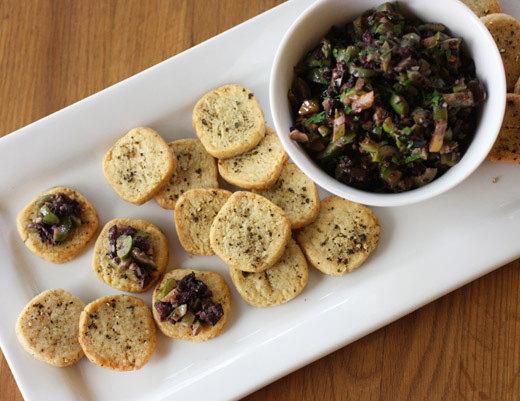 For this warm olive tapenade, I use a mix of meaty, bright green Castelvetrano olives (find them at olive bars or in jars at better markets) and brinier kalamata olives to achieve a balance of sweet, salty, fruity, and bitter flavors. This warm dip goes splendidly with the Caesar’s Sables, the Smoked Almond Thins, and the buttery Macadamia Nut and Coconut Flour Club Crackers. It can be stored in the refrigerator for up to 2 weeks, so it’s a great homemade holiday gift; consider making a double batch so you can share the warm olive love. In a food processor, pulse all the olives until they form a chunky paste the consistency of granola, or mound them on a cutting board and chop with a sharp chef’s knife. There was a time when I would have completely botched this dish, and it’s not a difficult thing to make. I had a track record for ruining Indian food. 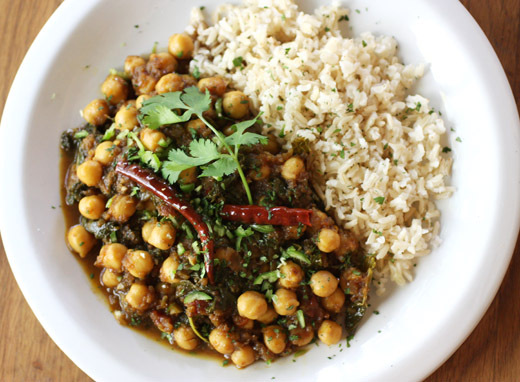 I’m not sure why but every time I set out to cook an Indian dish, I ended up being rushed and not paying close enough attention to measuring spices or simmering times. The results were always terrible. Even now, if I mention I’m making something Indian, Kurt’s instinct is to start looking at take-out menus. Now, I know that the problems I ran into in the past were all related to the “three p’s.” I’ve been reading Cooked: A Natural History of Transformation , and in Part II Water, Michael Pollan mentions patience, presence, and practice in cooking. You have to give each step of cooking the time it needs. Onions need to saute until softened and translucent, for instance, and not be rushed. You need to be aware of how ingredients are changing as they cook by listening to the sounds coming from the stove, smelling the ingredients as they cook, and tasting as you go. And, then, there’s practice. Practice makes perfect, or at least, practice makes you more comfortable cooking a dish when you know what to expect along the way. Slowly, but surely, I seem to be getting better at the three p’s and hopefully improving my track record. This recipe is from Saveur and couldn’t be easier so long as you give each step the time it needs. 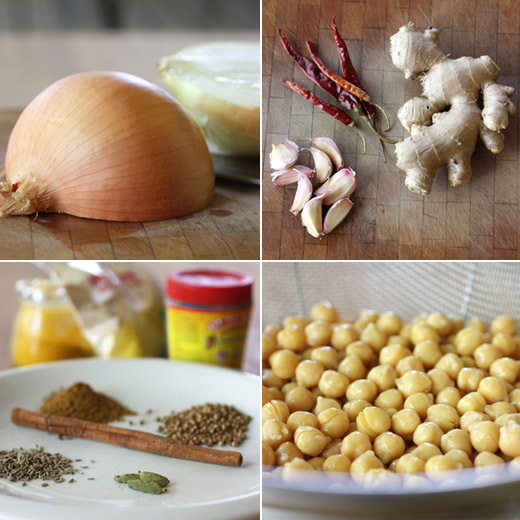 First, you make a paste in a food processor with minced fresh ginger, garam masala, turmeric, fresh garlic, and water. Then, in large saucepan or Dutch oven, oil is heated, and coriander seeds, cumin seeds, cardamom pods, dried chiles de arbol, and a cinnamon stick are added. When fragrant, chopped onions are added. There’s a lot of onion in this dish, the recipe calls for two large yellow onions, but they cook slowly, brown nicely, and become the base layer of flavor. After the onions have started to brown, the garlic paste is added and cooked for a few minutes. Next, canned, whole tomatoes that have been roughly crushed are added and the cooking continues until the liquid from the tomatoes had reduced a bit. 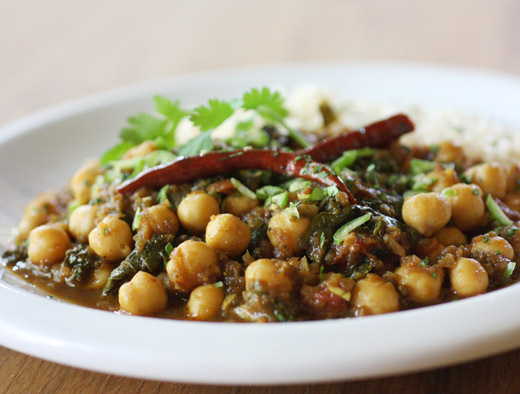 Tamarind paste and canned chickpeas are then added, and the stew is brought to a boil, reduced, and left to simmer for about 45 minutes. I couldn’t resist adding some chopped greens, and Kurt might be right that I add greens to everything. Last, additional garam masala, amchoor, and salt are added. I upped the spiciness with some cayenne and garnished each serving with cilantro and sliced serrano chiles. The amount of amchoor, or green mango powder, that’s added at the end is tiny at one quarter teaspoon, but it really makes a difference. It adds a sour edge that brightens the mix of flavors. Back when I used to rush through a recipe or not plan ahead well enough, I might have skipped it. But, I get it now. Sometimes little details make a big difference, and remembering the three p’s brings about good food. I’ve never visited Charleston, South Carolina, but after hearing the Lee brothers describe the fresh oysters and fish of the waterways, the variety of locally-grown fruits and vegetables, and the rich cooking traditions of their hometown, I hope to get there someday soon. Matt and Ted Lee recently taught a class at Central Market Cooking School, and I attended with a media pass and received a copy of their latest book The Lee Bros. Charleston Kitchen . I posted some photos from the class on my Facebook page. The book brings together classic, iconic Charleston dishes, with updates in some cases, and stories of their origin. I had never heard of the liqueur called Rock and Rye which is a Charleston favorite. It’s made with rye whiskey and candied oranges, and I can’t wait to make it this winter. Other classics include dishes like Deviled Crab, Four-Pepper Collards, Peach Upside-Down Skillet Cake, and Shrimp and Grits. 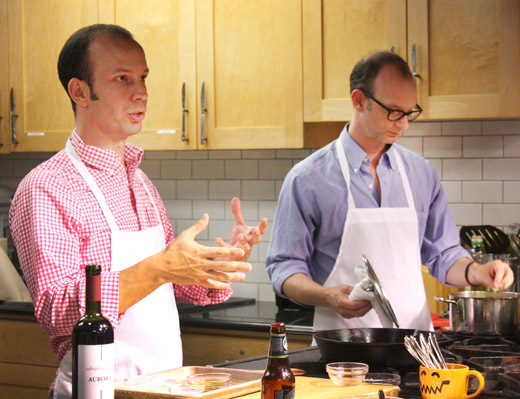 During the class, the brothers explained how Shrimp and Grits has changed over the years. Originally, it was a simple dish of shrimp cooked in butter with salt and pepper and served over plain hominy grits. Over the years, tomato found its way into the sauce with the shrimp, and then one restaurant after the next added new and different ingredients to personalize it in various ways. The version they shared includes tomato and bacon but otherwise keeps the complexity in check. The grits are made with milk and butter but no added cheese. It’s an interesting journey to follow a dish backwards to where it began and note its changes over time. The Syllabub has an interesting history as well. In Charleston, it was originally served more like a drink and always with rosemary which grows prolifically there. The night of the class, we were served an updated, layered syllabub of whipped cream with Madeira and fresh strawberries. After the class, I started flipping through the book and the Shrimp Popovers immediately caught my eye. 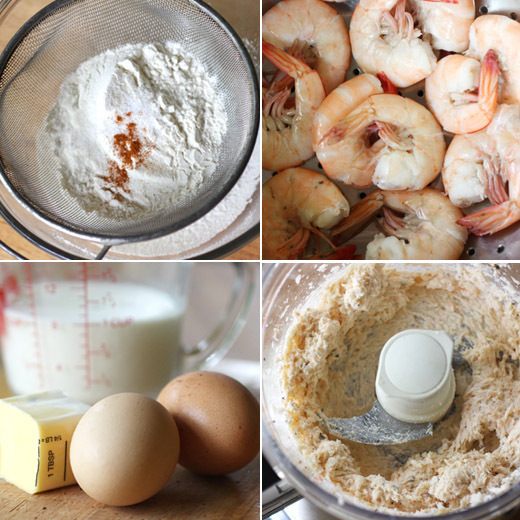 It’s a straightforward recipe for popovers, but a spoonful of shrimp butter is placed in each cup of batter before baking. They smell delicious as they bake and puff up to full height, and they come out of the oven light and airy with crispy edges all around. The full recipe of shrimp butter in the book makes a lot more than you need for the popovers, so I made a half portion of it and still had enough for two batches of popovers. The quantity I made included a half pound of shrimp which were briefly boiled in salted water and then cooled, shelled, and deveined. The cleaned shrimp were combined with four tablespoons of butter, a little salt, and a pinch of sugar in a food processor and pulsed until no lumps were visible. The shrimp butter should be refrigerated for about an hour before using, or it can be stored in the refrigerator for up to four days. 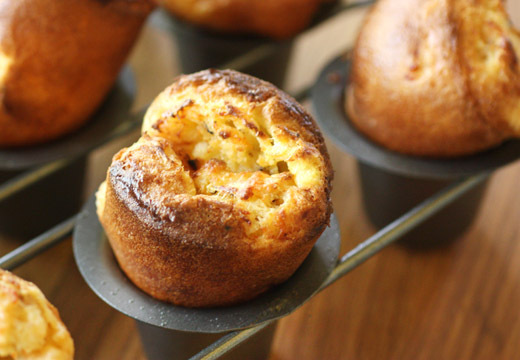 For the popovers, a cup of flour, one-half teaspoon of salt, a pinch of sugar, and I added a pinch of ground cayenne were sifted together before a cup of milk, two tablespoons of melted butter, and two eggs were whisked into the mix. 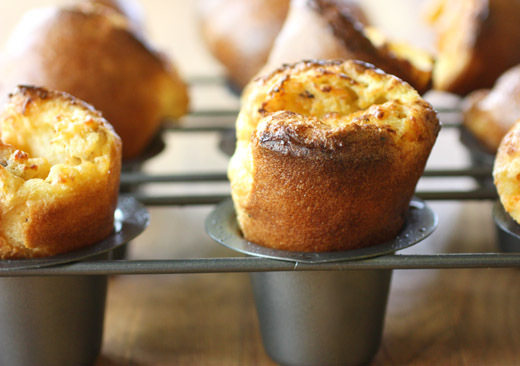 The popover pan was heated in the oven for the last few minutes as it came to 450 degrees F. I brushed nine of the cups with melted butter before pouring in the batter to fill each cup about two-thirds full. A spoonful of shrimp butter was added to each cup, and the popovers baked for 20 minutes. The popovers are perfect when just cool enough to handle, but they can also be reheated for a few minutes before serving if baked in advance. And, there are several suggestions for using any extra shrimp butter like spreading it on toast or biscuits, stirring it into grits, or tossing it with pasta. Until I get a chance to visit Charleston in person, I’m happy to continue getting acquainted through the food in this book.